Tackling the climate crisis needs workers to build a world fit for the future. This conference aims to challenge the false choice of good jobs versus the environment. Instead of settling for this, there is both an urgent need for action on climate change and a real opportunity for trade unionists to be at the forefront of campaigning for a transition. One which puts the needs of the planet, decent jobs and social justice at the top of the political agenda. Energy Democracy: How can trade unions 'resist, reclaim, restructure' the energy system? The global trade union campaign, Trade Unions for Energy Democracy, believes that the only way we can transition to 100% renewable energy is through public ownership and democratic control of our energy system. The future is decentralised, flexible and diverse with new renewable sources of energy large and small, from tidal to solar. What could these radical changes mean for trade unions across the well unionised energy sector, and how should they respond? Can popular trade union and community support be won for reclaiming the power sector to public ownership? Currently food and agriculture is a major contributor to the emissions which lead to climate change. This workshop will look at why this is the case and what kind of changes would be needed to make our food systems more sustainable. This raises important questions about diet, the current organisation of food production and the type of jobs needed to organise food production which doesn't contribute to the climate crisis. What's really happening to our climate? This workshop aims to outline clearly what's happening to our climate, why and what the impacts will be. It will present a case that climate change is a key issue for trade unionists and working people and that trade unionists have the potential to be a big part of the solution. Some unions have championed the role of workplace environment reps. These are trade union members who can play a vital role in campaigning for ways to protect the environment through change at work. Environmental reps also help raise the understanding and profile of campaigning on climate change within the trade union branch and in national policy. This workshop will outline the importance of environmental reps and aid those who want to get involved with this work. Climate change is creating millions of displaced people across the world, as a result of long terms climate changes affecting jobs and livelihoods or by the impacts of extreme weather events. This can divide people or present opportunities for greater understanding and solidarity. This workshop will challenge the narrative of division and instead examine what work can be done within the trade union movement to campaign for solidarity with climate refugees and action against the causes of climate change. 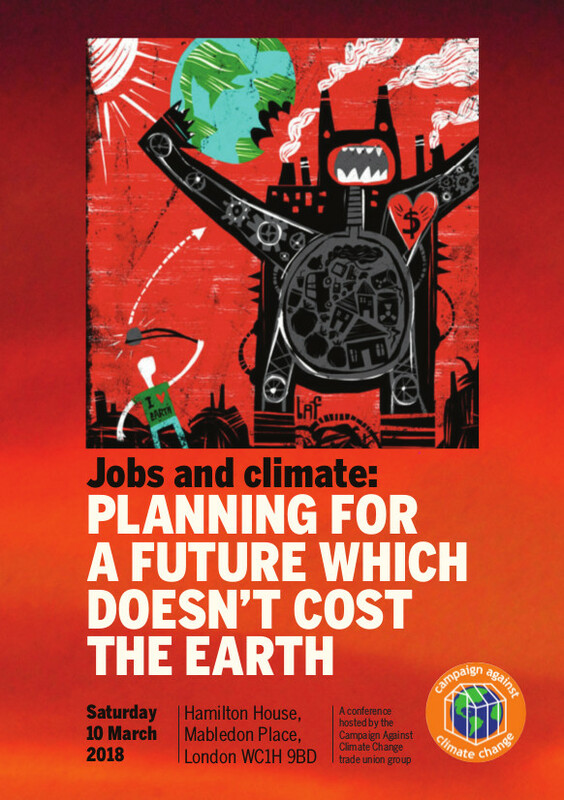 The first One Million Climate Jobs report was produced in 2009 outlining the need for a national climate service and how a million jobs could be created which would reduce emissions and tackle climate change. Now on the third edition, in the intervening years the need for action has become ever more urgent and public support for a return to government run public services is strong. This workshop will revisit the case for climate jobs in a domestic and international context, with lessons from the UK and from Norway's popular climate jobs campaign. This workshop hosted by the Greener Jobs Alliance will provide an expert briefing and critique of the Government's controversial Industrial and Clean Growth Strategies. Can the governments strategy really deliver a low carbon economy? Is the strategy consistent with carbon reduction targets and international obligations under Paris agreement and the Sustainable Development Goals? And crucially, how can unions ensure that the principle of just transition is embedded into each industrial sector of the economy? The Lucas Plan was a pioneering effort by workers at the arms company Lucas Aerospace to retain jobs by proposing alternative, socially-useful applications of the company's technology and their own skills. This workshop hosted by the Lucas Plan group looks at how the Lucas Aerospace (LA) workers' ideas of socially useful production can be developed to address our current crises. A Just Transition needs to rethink basic concepts of what we produce and how we produce it. The workshop following the hugely successful 40th anniversary conference and will look at the work of the Lucas Plan group how these ideas are being developed for a New Lucas plan. Continued investment in high carbon industries is seen by many as necessary because of the jobs which are created. In addition it is also suggested by some that the concerns raised by those campaigning about climate change are exaggerated or unjustified. Activists and trade unionists involved with some of these crucial debates about fracking, airport expansion and biofuels will introduce a discussion on these issues. The workshop will examine what's at stake and discuss the jobs issue often at the heart of the debate for trade unionists.